Not to overstate the obvious, but brows are having a moment, and we're pretty sure that moment's not ending any time soon. Getting those perfect arches takes serious time, though. Whether you pencil in your set or play artist with a brush and powder, all that hard work simply washes away at the end of the day—if it lasts that long. (Moment of silence for those times we absentmindedly itched our brows off our faces.) 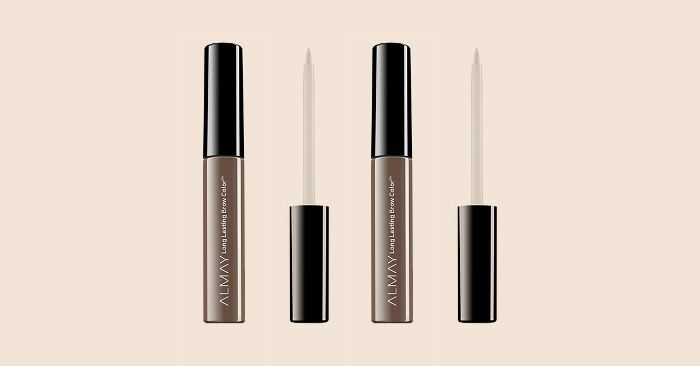 Of course, you could put in the time and money to get your brows professionally tinted, but we have an alternative (and affordable) solution: Almay Long Lasting Brow Color™ ($12), an easy-to-apply, peel-off brow formula. Read on to find out why it's a must-have in our makeup kits. Almay Long Lasting Brow Color™ is a peel-off formula that'll seriously stay put. Simply "paint" on a thick coat of the sugar-based formula, let it dry for 15 to 30 minutes, and gently peel it off in the direction your hair naturally grows. Once your brows are darkened and defined, they'll last. (And let's be honest, when your brows are done, do you really even need any other makeup?) Plus, the brow color comes in four shades—dark blonde, brown, brown black, and auburn—so you can find the one that looks most natural against your own hair. Have sensitive eyes or wear contacts? No problem—it's also hypoallergenic, ophthalmologist-tested, and safe for your eyes. How long does it take you to get the perfect set of brows?